The only reason I sat still long enough to purchase this book was because I came down with a bad throat infection. After reading through the first part of the book I thought, "no wonder I'm sick!" This book offers practical, biblically based help for women who have been going too fast for too long. I'm grateful for the truths I learned in this book and am looking forward to applying them. —M.L. It was lovely to read Help For Women Under Stress. The discussion questions following each chapter will be especially helpful for the application of the principles and scriptures you cite. I also appreciate the lengthy Notes you included at the back (and all the hours of reading and research they represent!). I pray that a new generation of women will be drawn to this book and greatly benefit from it. May they, then, also be equipped to effectively share with others about this important topic. – C.T. Your first edition of this book really helped a lot of women in our church when I taught it many, mnany years ago. 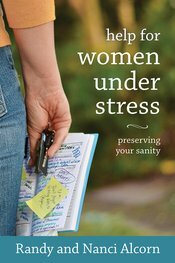 I'm so glad to get the updated Help For Women Under Stress book! -G.P. I thought this book would be about how to fix my stressful circumstances, but instead it's more about how to take better care of myself so that I both handle the stress better and, better yet, avoid it in the first place by the decisions I make! I love the very practical advice... it's very doable, even for a busy mom! —B.A. Learn more about and purchase Help for Women Under Stress.